Gov. Cuomo: My Dad Was "Anything But a Typical Politician"
Former Gov. Mario Cuomo's legacy as a liberal leader, powerful orator and immigrant's son whose humble upbringing inspired his approach to public service were championed at his funeral Tuesday by an inarguable heir to his example — Gov. Andrew Cuomo, his son. "At his core, he was a philosopher. He was a poet. He was an advocate. He was a crusader. Mario Cuomo was the keynote speaker for our better angels," the younger Cuomo said in a eulogy that spanned from his father's biggest speeches to his fierce competitiveness on the basketball court. The former three-term governor — who flirted with but never made a presidential run and turned down an opportunity to be nominated for a U.S. Supreme Court seat — was a humanist whose politics were part-and-parcel of his beliefs, not strategies for pleasing people, the younger Cuomo said. He was, he said, "anything but a typical politician." Billy Joel talks to Melissa Russo outside the Manhattan funeral for former Gov. Mario Cuomo Tuesday. The iconic singer explains what the former three-term governor meant to him. Dignitaries from both sides of the political aisle gathered to mourn the Democratic Party icon. The 82-year-old died Thursday at 82, hours after his son was inaugurated for a second term. Bill and Hillary Clinton, Attorney General Eric Holder, Mayor de Blasio, state Senate Republican leader Dean Skelos and former Mayor Michael Bloomberg were among the dignitaries in St. Ignatius Loyola Church's 800 packed seats. 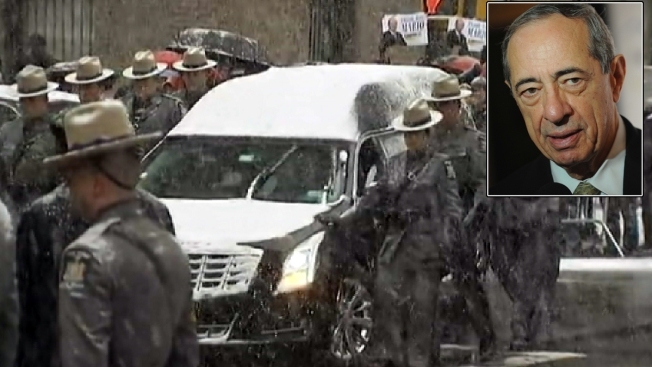 Democratic State Assembly Speaker Sheldon Silver put off taking his seat before the funeral started, standing outside in the snow to await the hearse. Pallbearers included Cuomo's younger son, CNN newscaster Chris Cuomo. On Monday, hundreds waited in a line that stretched more than a block to pay their respects at Mario Cuomo's wake. Vice President Joe Biden, House Minority Leader Nancy Pelosi, Democratic Sen. Charles Schumer of New York, actor Alan Alda and former state Comptroller Carl McCall were among those who paid tribute. As governor from 1983 to 1994, Cuomo became known for his oratorical skills, for powerful appeals for social justice that blended liberal ideals with his personal experience as the son of an Italian immigrant grocer, for an intellectual nature given to discoursing on Jesuit philosophy along with discussing public policy — and for his deliberations over running for president, which earned him the nickname "Hamlet on the Hudson." He came close to running in 1988 and 1992 but decided not to. Why? "Because he didn't want to" and loved being governor, Andrew Cuomo said in a heartfelt speech that blended political legacy, personal memories and calls to move the state forward in his father's footsteps. The elder Cuomo was most remembered for a speech at the 1984 Democratic National Convention in San Francisco, where he focused on an America divided between haves and have-nots and scolded Republican President Ronald Reagan for not working to close that gap. A son of working-class Queens and of economic struggle, Cuomo came to politics as an outsider, and "it made him the figure he became," Andrew Cuomo said: "He understood inequality from experience." But as governor, the elder Cuomo also cut taxes and the state workforce to exercise fiscal restraint, Andrew Cuomo noted. "My father called himself a progressive pragmatist. ... His goals were progressive, but his means were pragmatic," he said, adding that he told his father no one understood what that meant — even his son. "He said he didn't care, and he wouldn't be reduced by the shortcomings of others, including mine," Cuomo said to chuckles from the audience. He said he regrets not leaving Washington, where he was then secretary of housing and urban development, to help on his father's unsuccessful bid for a fourth term in 1994. Winning that office for himself in 2010 was a victory he cherished more for his father's sake than his own, Andrew Cuomo said. And after he won re-election last fall, his father made it to his victory party. He was too weak to attend his son's second inaugural speeches on New Year's Day, and his death came only after — minutes after — Andrew Cuomo finished the second of two speeches. The people who live in the same neighborhood with Mario Cuomo grew up are fondly remembering the former governor. Andrew Siff reports. "He waited," said the governor, who called his father his hero, best friend and inspiration.